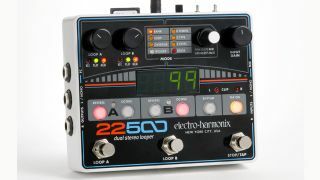 SUMMER NAMM 2015: Increasingly prolific effects co Electro-Harmonix has launched two new pedals for Summer NAMM: the 22500 Dual Stereo Looper and Silencer Noise Gate/Effects Loop. Expanding on previous loopers, such as the 45000 and Nano Looper 360, the 22500 features two tracks that can be played in parallel or series, offering up the opportunity to switch harmonies and rhythms in and out, or use each loop as a different song section. Loop A and B footswitches control recording, playback and overdubbing, while a third switch can function as a stop, tap tempo or rhythm start/stop. Reverse and octave buttons, 100 loop banks, quantized looping and built-in drum loops further expand the pedal's feature set. In addition, the 22500 offers full stereo operation, XLR mic inputs with phantom power, and up to 12 hours of recording time using the included 8GB memory card, while a USB port allows users to backup and restore loops to a computer. A Bank-Up/Bank-Down Foot Controller ($117.15) is also available. The Silencer, meanwhile, offers the ability to silence a single pedal or entire effects loop through the use of its built-in send and return jacks. A trio of knobs - threshold, reduction and release - adjust the noise reduction, while a footswitch switches between the pedal's engaged and buffered bypass states - the buffer enables pedals to remain in the signal path when the Silencer is bypassed. The 22500 and Silencer are available in August for $359.97/£231 and $76.80/£49 respectively. Head over to EHX for more.